American is planning to offer the service on all of their domestic flights by the first quarter of 2013 and on all of their international flights by the second quarter of 2013. It’s easy to pre-order your meal, all you have to do is access your reservation online at least 24 hours before your flight and place your order. 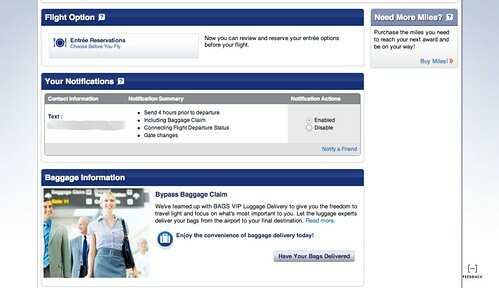 Go to AA.com and access your reservation. 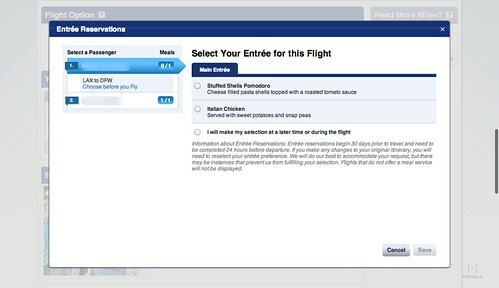 Look for the “Entrée Reservation” button under the “Flight Option” section bar. After selecting the passenger name you’ll see the dining choices. Make your selection and save. You’re able change your mind up to 24 hours before your flight . I decided that the chicken looked like the more healthful option; it’s really nice being able to make that choice. My prediction is that this service is going to be really popular. What do you think? 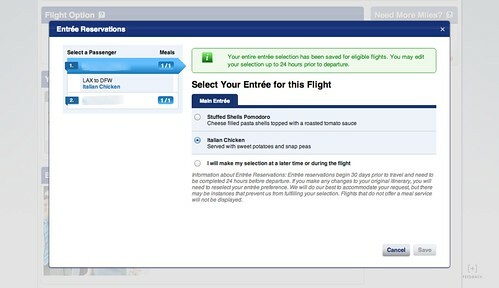 I hope they add an option to receive miles in lieu of the meal. Definitely in favor of this option. Wonder if they are going to start adding variety. Haven’t flown United 1st in a couple of years but they used to offer several options including low-fat, vegetarian and kosher. It would be great if AA moved in that direction. Didn’t work for me on a recent flight. I may end up flying LAX-DCA in a few weeks. Looking forward to trying this! Anything that makes travel more predictable makes it less stressful, so it’s a good addition, albeit obviously affecting only a small number of travellers. They should add this option at some point for all passengers. It could probably cut down on costs or help with passengers having the meal they want available always. 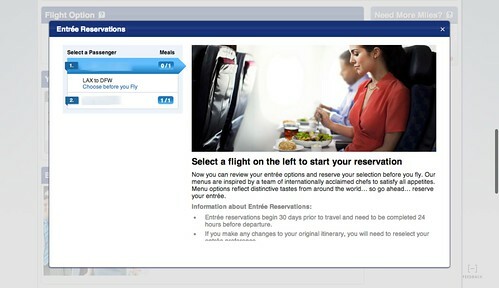 For flights without meals they could also offer a pre- paid meal option. We did this on our 3 flights with Air Asia around Southeast Asia this summer. We were able to choose from more options since meals available during the flight are limited. It also saves time with picking and paying on the spot.